Home » International Education » How Global Is K-12 Education in America? Charles Kurzman, “How Global Is K-12 Education in America?” April 30, 2015. Ready or not, our children will be launched into a big wide world of global interconnectedness. How well are their schools preparing them for this transnational era? 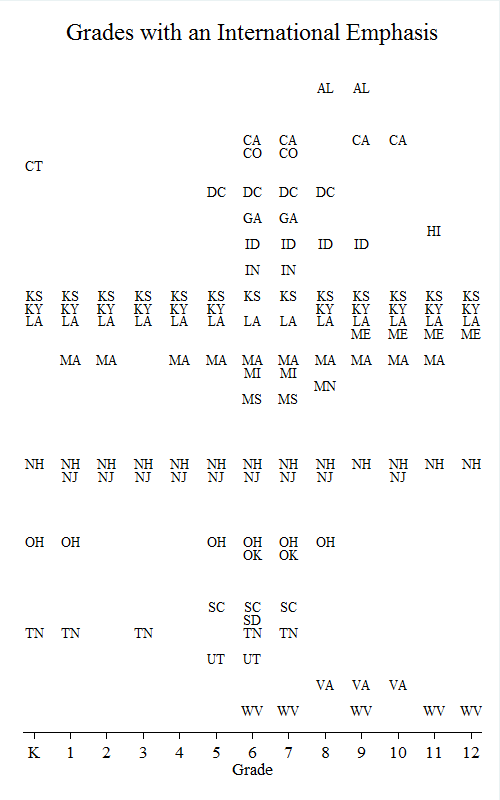 I downloaded the standards from all 50 states, plus the District of Columbia, for each grade from kindergarten through high school, and searched through these standards for references to places and people outside of the United States, as well as references to “Earth,” “world,” “globe,” “international,” and related terms. The result is a database of more than 63,000 standards, of which approximately 49 percent refer to some international subject, either in the headings or the examples. (See the technical note below for information on my method.) Just over half of these international subjects (27 percent) also refer to the United States, such as references to American military operations abroad. Rather than draw students’ attention to multiple scales, from local to global, too many states set standards that focus only on one scale at a time, segregating the United States from the rest of the world. Colorado’s state standards, for example, make no reference at all to the world beyond the United States in third grade, and restrict global education primarily to sixth and seventh grades. This is not uncommon around the country: sixth and seventh grades are most likely to have an international emphasis, defined here arbitrarily as including international references in three quarters of the state’s grade-level standards. (See graphic, “Grades with an International Emphasis.”) These are often the grades where schools focus on “World History,” separate from American history or state history. And what regions of the world do state standards focus on? Even among states whose standards are relatively cosmopolitan, many of the international references are to the world as a whole, not to any particular foreign subjects. Where specific places appear, the most common region is Western Europe, which averages 12 percent of all states’ standards. Various other world regions — East Asia, Eastern Europe/Eurasia, Latin America, the Middle East, South/Southeast Asia, and Subsaharan Africa — average 3.6 to 4.7 percent of references. Referring to international subjects in state standards is not enough to guarantee a global education, of course. The content of these references matters too. Some world regions seem to pop up in the standards at scattered moments in history — the Middle East, for example, appears primarily under the rubrics of ancient Mesopotamia, early the emergence of Islam, the Crusades, and then post-colonial independence and recent conflicts, especially conflicts involving the United States. There are centuries and subjects that get almost no attention at all, creating a lack of continuity and context. And then there are problematic details. Alabama’s 12th grade standards, to pick one example, offer Iran as the prime site of “authoritarian government,” as opposed to “constitutional government” (United States) and “totalitarian government” (North Korea). Perhaps these countries were drawn from President George W. Bush’s famous “axis of evil” speech in 2002, which falsely suggested that Iran and North Korea formed a military alliance, along with Iraq and terrorist organizations, that threatened the United States with weapons of mass destruction. (Iraq’s “evil” axis was removed by the U.S.-led invasion the following year; today, paradoxically, Iraq’s government is more closely allied with the Iranian government than ever before.) For all of its political problems, though, Iran is a misleading model of authoritarian government, since it is also a constitutional regime (albeit a constitution that gives the leader almost unchecked powers) and holds regular elections (albeit with a limited range of candidates). Most importantly, Iran’s constitution is theocratic, with a religious scholar as head of state — possibly the only such arrangement in modern history, and so not an appropriate archetype for authoritarian governments worldwide, which are more likely to be led by monarchs or current and former military officers. As a footnote to this discussion: two decades before the “axis of evil,” the President Ronald Reagan’s administration reserved the term “authoritarian” for allies of the United States — only enemies were considered “totalitarian.” Are Alabama’s 12th graders getting all this? Even when the standards seem appropriate, we would want to examine how they translate into actual classroom learning. That’s a topic for another time. The school standards at TeachingHistory.org have not been updated since 2012, when I first downloaded them; some states may have changed standards since then. The formatting for the standards is uneven, with up to four levels of specificity; I’ve tried to nest each level in the higher-order levels. I then searched each standard using a dictionary of geographic terms and famous people’s names, with inevitable mismatches and missed matches. From an eyeball review of a sample of the results, I believe the inaccuracies are a relatively small proportion of the total. 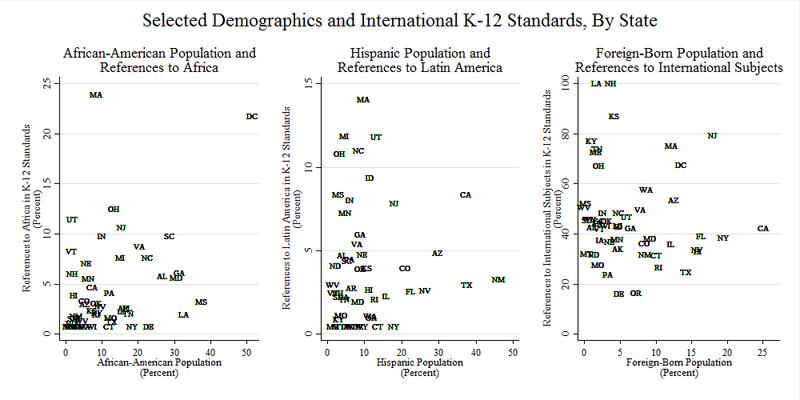 Some states have far more extensive standards than others, and some grades have more extensive standards than others, so the rate of international references is aggregated by state and grade level before averaging. Figures for race and ethnicity come from the 2010 U.S. census; figures on foreign-born population come from the 2003 American Community Study.